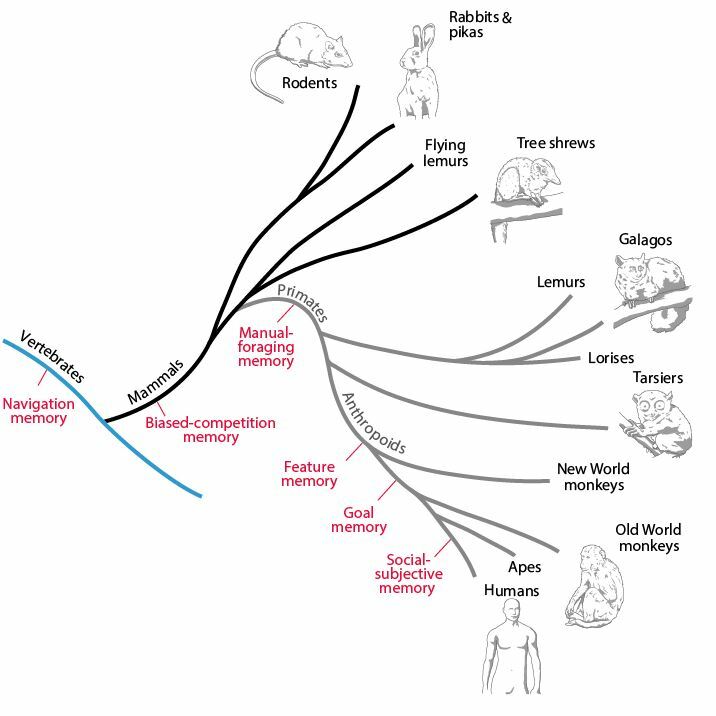 Like all biological traits, human memory reflects a long evolutionary history, most of it shared with other animals. Yet, with rare exceptions, evolution has either been overlooked in discussions of memory or treated in an outdated way. As a result, a simple idea about the cerebral cortex has reigned for more than a century: that its various areas specialize in functions characterized as memory, perception, the control of movement, or executive control (mainly decision-making). By taking a contemporary view of brain evolution into account, however, it’s clear that the brain simply doesn’t work this way. Instead, evolution has led to different parts of the cortex specializing in distinct kinds of neural representations, many of which evolved during major evolutionary transitions. Representations, in this sense, correspond to the information processed and stored by a network of neurons, and they underpin our memories as well as our ability to perceive the world and control our actions. Several representational systems built up during evolution, with each new system adding to those inherited from earlier ancestors. These systems arose for the same fundamental reason: to transcend problems and exploit opportunities encountered by specific ancestors at particular times and places in the distant past. In effect, modern memory emerged via evolutionary accretion. …with rare exceptions, evolution has either been overlooked in discussions of memory or treated in an outdated way. Reinforcement-learning systems evolved in early animals. All modern animals have inherited this diverse collection of brain mechanisms, and they interact with representational systems that evolved later. The navigation system evolved in early vertebrates. It originally provided advantages in navigating along novel paths using map-like representations, but it later adapted to a wide range of behaviors. Some of the oldest parts of the cerebral cortex specialize in such representations. The biased-competition system evolved in early mammals, based on a new kind of cortex that emerged in these animals: neocortex. This representational system dealt with information that enabled early mammals to regulate older systems when they competed to guide behavior. The manual-foraging system evolved in early primates. Housed in a suite of new cortical areas, it guided the choices and actions that enabled early primates to reach for, grasp, and manipulate items of value in the thin branches of trees. The feature system evolved in anthropoid primates. It improved the perception and memory of both the qualitative and quantitative features of their world, which guided long-distance foraging as they became larger, farther ranging animals. New parts of the parietal and temporal lobes, along with some older areas, provided this advantage. The goal system evolved a little later, in new parts of the frontal lobe that emerged in anthropoids. It generated goals—the targets of action—from representations of goal-related events, as well as from abstract strategies. Yet later, during human evolution, the feature and goal systems began to perform more-general functions, resulting in sophisticated reasoning, symbolic communication, and mathematics, along with the generalizations, concepts, and categories that underlie semantic memories. Early humans developed new kinds of representations of themselves and others: a social–subjective system. Once these new representations began to interact with older ones, our ancestors developed a sense of participating in events and knowing facts, the hallmarks of autobiographical memories and cultural knowledge. As humans, we have an ancestry stretching back hundreds of millions of years: a direct line of descent, parent to offspring, over countless generations. The figure below depicts some of our closest relatives, and it highlights the fact that we are many things besides Homo sapiens. We are also anthropoids, primates, mammals, and vertebrates, among other things. By embracing all of our ancestors we can both enlarge our identity and develop a deeper appreciation of how evolution produced our memories, our complex cultures, and the stories of our lives. Adapted from Mary K. L. Baldwin, Dylan F. Cooke, and Leah Krubitzer. Intracortical microstimulation maps of motor, somatosensory, and posterior parietal cortex in tree shrews (Tupaia belangeri) reveal complex movement representations via Cerebral Cortex, 11 January 2016. Used with permission. Featured image credit: Old Vintage by kaboompics. CC0 public domain via Pixabay. Elisabeth (Betsy) A. Murray is Chief of the Laboratory of Neuropsychology at the National Institute of Mental Health. She received a BS degree from Bucknell University and a PhD from the University of Texas Medical Branch. Steven P. Wise is a retired biologist formerly at the National Institute of Mental Health. He received a BA degree from Dartmouth College and a PhD from Washington University. Kim S. Graham is Professor of Neuroscience and Dean of Research of the College of Biomedical and Life Sciences at Cardiff University. She received a BSc from Edinburgh University and a PhD from Cambridge University. 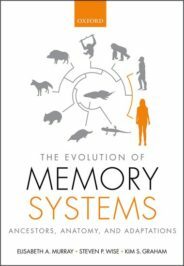 Betsy, Steve, and Kim are also co-authors of The Evolution of Memory Systems.